Infusing the dexterity of our workforce with our unmatched experience, we, Antique Ceramic, showcase a wide range of Sanitary Fittings that are demanded all over the world. 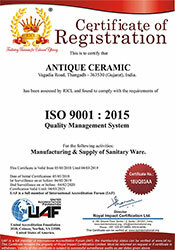 Established in the year 1987, we have embossed our name as one of the most respected manufacturers and exporters in our domain with our range of Bathroom Sanitary Ware, Ceramic Sanitary Ware, Sanitary Fittings, Washroom Sanitary Ware, Pedestal Wash Basin, Printed Wash Basin, Water Closet, Indian Pans, Urinal Accessories, Color Palettes, etc. Moreover, we have tie up with various tile manufacturers in Thangadh, so that we can help our customers with an exquisite range of tiles as well. All the raw material used in our sanitary ware products are of high quality, and are procured from trusted vendors. These vendors fabricate products aligning with global standards. Moreover, we also have a talented team of quality auditors that monitor the entire process of product development. We want inquiries from Gulf Countries, African Countries.